Circles, circles, everywhere! 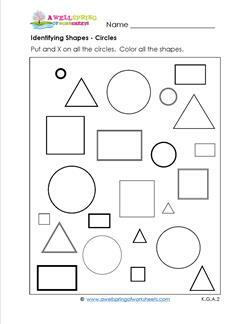 Our circle worksheets for kindergarten provide a variety of skills for your students to polish up on. 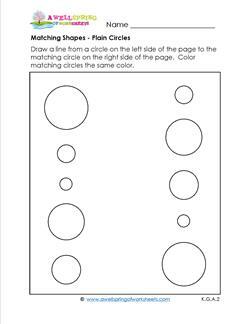 At this time we have worksheets for identifying circles and matching identical circles. 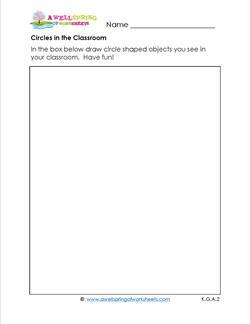 You can have your kids look around the room and draw objects in the classroom that are shaped like circles. They’re sure to find plenty of objects – right down to the hole their shoelace threads through! Don’t forget the skills of drawing and coloring, too! There’s opportunity to brush up on those skills with these worksheets as well. Wow! Look at all those shapes! Kids will take a close look at this page and color only the circles. They come in different sizes and orientations. The shapes on this worksheet are randomly placed and spaced. Kids identify the circles by putting an X on each one (hint: there's 7 of them!). Color the shapes. This is simply a blank page for kids to attach to a clip board and take around the classroom looking for circles in the environment. What can they see? A clock? A circle poster? 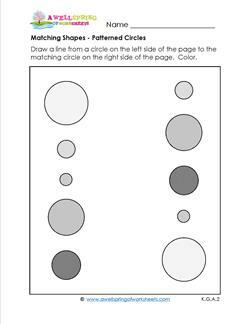 In this matching shapes worksheet kids draw a line from a circle on the left side of the page to the matching circle on the right side of the page. Coloring is optional. 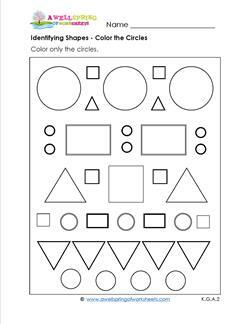 This matching shapes worksheet uses colors, shapes, and sizes. 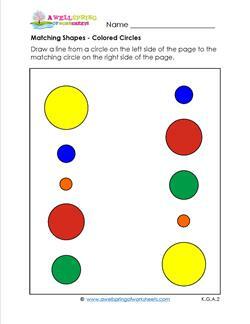 Draw a line from a circle on the left side of the page to the matching circle on the right side of the page. Draw a line from a circle on the left side of the page to the matching circle on the right side of the page. Look for the size and the pattern to match.